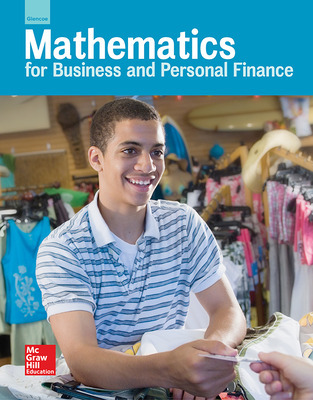 Mathematics for Business and Personal Finance teaches students mathematics, in the context of business and personal finance like budgeting and money management, banking and credit, and saving and investing. This program provides valuable information on how to use math in everyday business and personal finance situations to fully understand how to manage one's financial resources effectively for lifetime financial security. 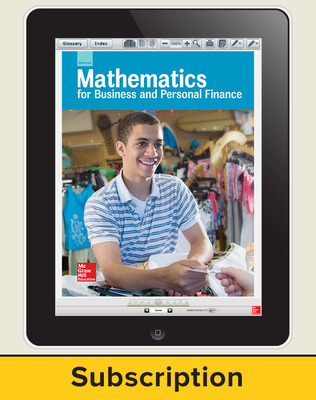 Mathematics for Business and Personal Finance can be taught in one or two semesters. Comprehensive standards-based curriculum meets Business and Math Standards. Project-Based Learning Unit Thematic Projects encourage students to think in novel ways and demonstrate their understanding and creativity. Rigorous Academic Content is integrated throughout the features and assessment in varied types of academic skills practice activities for Math, Science, Social Studies, and English Language Arts. Research-Based Reading Strategies promote reading success and help students improve their comprehension skills. Differentiated Instruction provides options for all types of learners and all levels of ability. Varied Assessment Options include section and chapter review activities and customizable testbanks in ConnectED. Standardized Test Practice sharpens students' test-taking skills. Algebra Practice, Graphing Calculator Labs, and Spreadsheet Applications are integrated into the content and assessments and provide students with additional practice. Real-World Careers describe jobs and include extension activities. Academic and Career Portfolio features help students build portfolios of their best work. 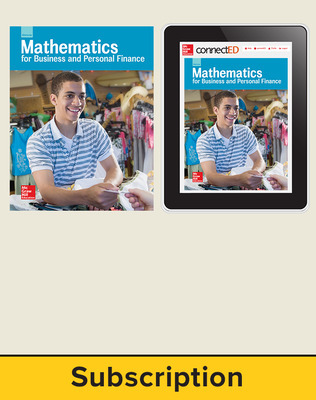 Math for Business and Personal Finance © 2016 features online resources on the MHE ConnectED platform empowering teachers to easily teach program material, manage classroom assignments, and engage students. Teachers can access the student eBook, digital resources, assessment and planning tools in one convenient location. Print teacher editions are available print-on-demand on Create™.